Fifteen men and one lady, were trained on how to manufacture bricks. 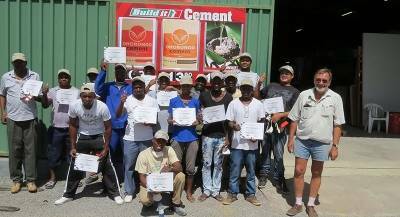 To assist with upliftment of the social welfare and living standards of the population of Kunene region, 16 people were trained at Outjo in the trade of brickmaking on 18 April 2018. The trainees from various towns & settlements within the region, received training at no charge from the Ohorongo Buildit Brickmaking Academy. According to the 2011 Population and Housing Census, traditional dwellings are the most common housing structures in the region. Most of them are made out of traditional building materials such as grass, stick, mud, dung and corrugated iron. “We hope that the trainees will go out and create employment opportunities for themselves in the construction industry by producing bricks for region’s needs. Moreover we would like to see the equalities in the standard of living in the region narrowing down as per our national development policies,” Hans-Wilhelm Schütte, Ohorongo’s Managing Director. The Ohorongo Buildit Brickmaking Academy, is the result of the Smart Partnership between Ohorongo Cement and one of its customers, the Buildit group, in support of the Harambee Prosperity Plan, as their contribution towards poverty alleviation in the country. “It is wonderful to note see that we can plough back into the communities in which we operate, by assisting with the transfer of skills. 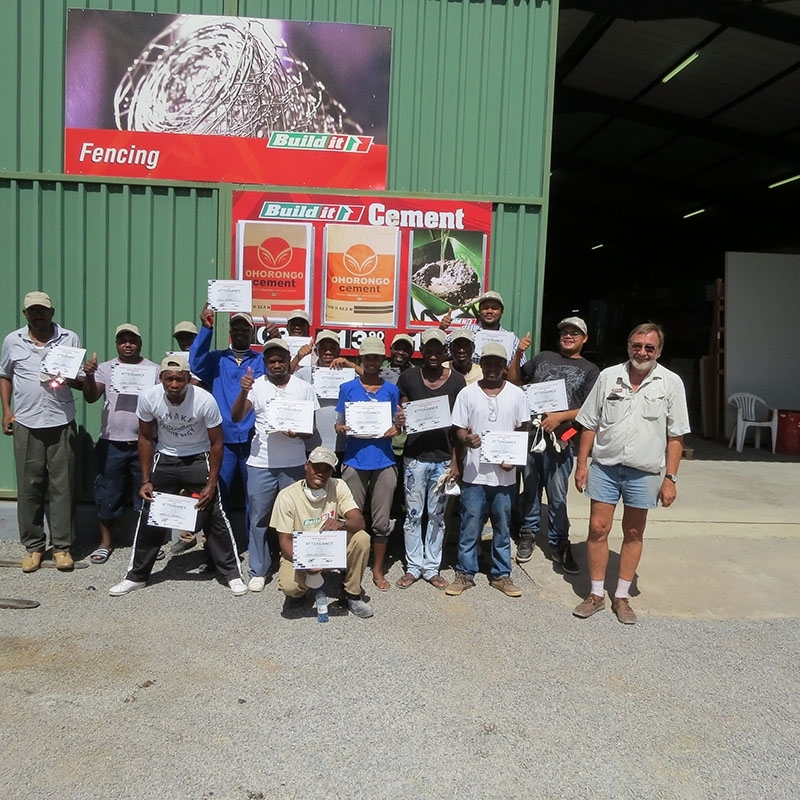 The trainees from Kunene are all unemployed youths and we have high hopes that they will put these new skills to good use in their communities,” said Paul Hinson, Category Buyer for the Buildit Group. Ohorongo Cement and Buildit established the academy in March last, with the aim of assisting Government in alleviating poverty, through imparting of skills and knowledge. Trainees are selected through liaison with the regional governors’ offices. The next brickmaking training will be held in the Zambezi next month, followed by the Karas and Hardap regions in June. The Academy will have its final training session in Omaheke region in July, when all 14 regions will have been covered.